One of the most respected authorities on all things birding, Bird Watcher's Digest recently published a really good article where, after some thorough testing, they compared, rated and ranked some of the best 8x42 binoculars currently on the market. 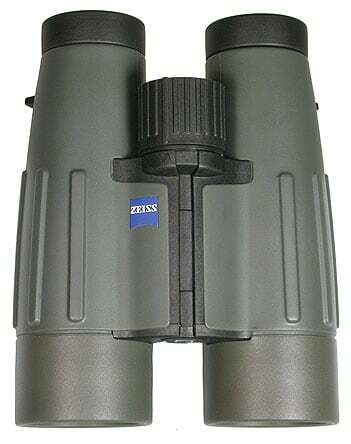 I thought that it would be both interesting and useful especially to those who are on the lookout for a premium grade pair of 8x42 binoculars ideal for bird watching, to go over their selections in detail as well as add a few of my own thoughts and opinions. Bird Watcher's Digest (BWD) approached a number of optics manufacturers, asking them to send them their high-end 8x42 binoculars. 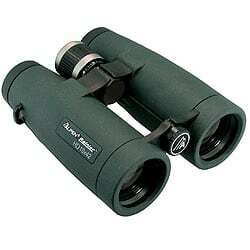 As a result, they received 12 pairs to test, however I am not sure how many, or indeed which manufacturers they approached and obviously they did not test ALL high end 8x42s on the market, so I would like to make it clear that this list is NOT the best 12 8x42 Binoculars on the market, rather this is a test of 12 very good, high end 8x42 binoculars. As well as this and as BWD point out in their article, companies like Zeiss, Swarovski, and Leica have a number of second tier, but still very high-quality binoculars that sit below their top-end models, which they also really wanted to compare and so of the 12 pairs of binoculars they received, 6 were priced $1,500 and up, and the other six were priced at around $1,000. Until very recently, the Victory FL was advertised as Zeiss's brightest binocular this has since changed as they have recently just introduced their New Zeiss Victory HT Binoculars, which are being described as the brightest super-premium binocular in the world! Even so the FL is still an awsome binocular that produces an incredibly bright and high quality image which comes from superior optical quality, including Zeiss fluoride glass, patented T* anti-reflective coatings, and phase corrected Abbe-Koenig prisms. The one turn to infinity focusing mechanism is also excellent, as are the four position click-stop eyecups, and easy-to-clean LotuTec coating. Fluoride Glass	Enhances resolution, color, and contrast. Birdwatcher's Digest comments: "The Zeiss Victory FL got the top overall score and tied for the top resolution score. With its wide field of view (405 feet) and outstanding optics, it creates a breathtaking experience of being immersed in the image. Zeiss attributes the bright, clear image and its great contrast and color in part to the special FL glass containing fluoride ions. A thin lens design, employing air-spaced elements, contributes to the excellent resolution and the light weight. Of the top five scorers, the FL weighs the least, at 26.6 ounces. It's a comfortable and universal ergonomic design. The barrels curve outward, gracefully fitting the shape of the palm of the hand. Ridges run lengthwise, with no thumb indentations to restrict where you put your thumbs. You can grip wherever feels natural to you. The smooth-turning focus knob is wide enough to turn with two fingers or with gloves. Its fast focus goes from lock to lock in just 1.1 turns. You can focus from 20 to 100 feet without lifting your finger from the knob. Close focus or infinity requires only one repositioning of your finger. The diopter adjustment mechanism, on the focus knob, has both a scale and a lock. The action is smooth and precise, with a detent at the center setting. Twist-up eyecups provide four extension adjustments, with detents. Although Zeiss claims only 16mm of eye relief, the FLs worked great with all of the judges' eyeglasses. The interpupillary distance of 54 to 74mm offers the narrowest setting in our survey, helpful for people with close-set eyes. LotuTec coatings on the exterior surfaces of the lenses repel water and dirt and allow easy cleaning. 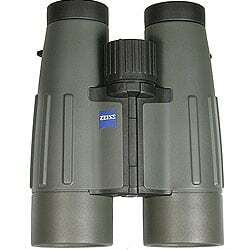 These Zeiss Victory Binoculars cost about $1800 - $2500 to $350 in the US and £300 to £400 in the UK. 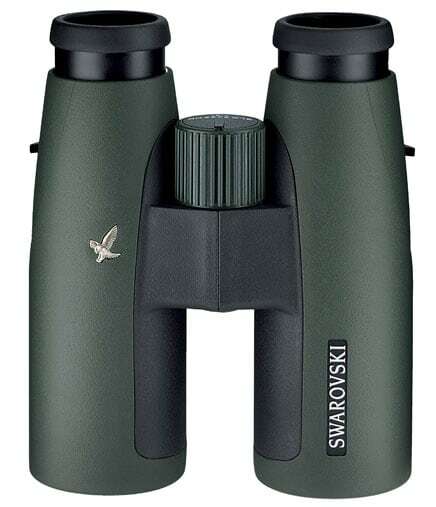 This latest Swarovski EL binocular comes with revolutionary new innovations that are said to provide virtually even images with razor-sharp clarity and outlines. Swarovski have improved their coating technology, which they say sets new standards for brilliance and image definition and guarantees optimum contrast in low light situations. If you factor in the phenomenal field of view offered by the EL 42 Swarovision, you have a binocular that will please even the most demanding user. 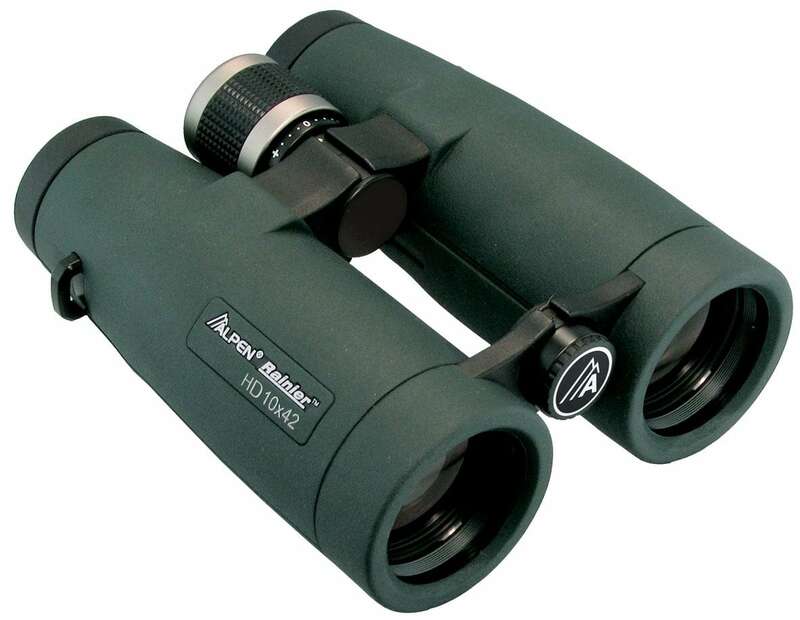 Birdwatcher's Digest comments: "Virtually perfect binoculars, with faultless optical quality, the EL Swarovisions are bright and stunningly sharp. Swarovski's "field-flattener lenses" achieve a field of view that is perfectly flat from edge to edge. Fluoride ions in the lenses contribute to the Swarovision's great contrast, resolution, and freedom from chromatic aberration. The open-bridge design invites your fingers to wrap around one of the barrels and hold and focus the binoculars with one hand. To accommodate thumbs and enhance the grip, the Swarovision has shallow indentations on the bottom. This was the closest-focusing pair of binoculars (4.9 feet) in our survey. The focus knob takes 2 1/2 turns, lock to lock. However, the first full turn is for closer than 9 feet. The next half-turn takes you to 19 feet, and the last turn goes to infinity. You get fine focusing up close, where you need it most, without sacrificing too much speed at a distance. An excellent diopter adjustment mechanism, under the focus knob, turns precisely, with detents. The numbered scale is easy to see, and even when the diopter is locked, you can still see enough of it to check your setting. Beautifully engineered eyecups click to four discrete positions. The eye relief of 20mm is the longest of the top five. Swarovski's Swaroclean coating on outer glass surfaces repels water and dirt and allows easy cleaning. Swarovski also includes a Snap Shot Adapter, a sophisticated ring that can link to a digital camera for digiscoping. Caveat: A side effect of the flat field of view is that the image seems to roll slightly when panning from side to side. Although some of our judges noted this effect, none found it troubling." State-of-the-art design incorporates fluoride glass with anti-reflective coatings to enhance color resolution and increase light transmission. The optimized Leica focus knob functions smoothly regardless of temperature extremes. The Leica AquaDura lens coating forces rain to roll off the lens surfaces, makes it easier to remove dirt and smudges, and provides better protection against scratching. 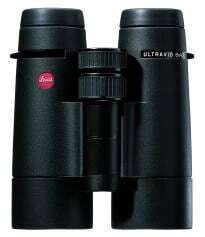 Birdwatcher's Digest comments: "The Leica Ultravid HD is as close to optical perfection as binoculars can get. It bestows a lucid and lovely view. Fluoride-containing lenses optimize color fidelity and resolution. The Ultravid tied for first place in our resolution tests. Half an inch shorter than the Zeiss Victory and Swarovski EL, the Leica Utravid feels compact and solid. The twist-up eyecups work smoothly and have detents. Prominent ridges on the underside of the barrels are designed to offer secure thumb placement. The doublewide focus knob can easily be operated by two fingers or with a glove. It turns precisely and with an ideal balance of ease and resistance. It's relatively fast: 1.3 turns from lock to lock, only about a 3/4-turn of which focuses from 20 feet to infinity. The diopter adjustment mechanism tied for our top score. There is a large, clear scale that faces the user and lets you see your setting at all times. The Ultravid HD employs Leica AquaDura hydrophobic lens coating, which repels water and dirt and makes cleaning easy. Caveat: Several of our judges remarked that the ridges on the underside of the barrels interfered with the way they preferred to hold the binoculars." Leica improves performance with the very sharp, bright, and scratch resistant HDC (Highly Durable Coating) coatings and have increased light transmission significantly with their HLS HighLux system. Just under 6 inches tall, the compact size, ergonomic construction, and tough magnesium housing guarantees this Trinovid will become a classic for this generation and beyond. Birdwatcher's Digest comments: "Leica's new Trinovid tied on every score with its flagship Ultravid. We compared the two Leicas carefully for brightness, color saturation, clarity, and resolution. To keep ourselves honest, we masked off all the external clues. We mounted the binoculars side by side and tried to tell their images apart. We couldn't. After many tries, even at 32x, we could we not see a difference in the optical quality of the two. The Trinovid has the same outstanding diopter adjustment mechanism, the same eyecups, and virtually the same shape. Both models have magnesium housing and are watertight to 16.5 feet. There are some differences, though. The Trinovid has a narrower field of view (376 feet vs. 389 feet); a greater minimum focus distance (11.5 feet vs. 9.8 feet); weighs about half an ounce more (28.6 vs. 27.9); and has bare metal strap lugs rather than the more elegant black molded lugs on the Ultravid. All told, the Trinovid seems like a bargain, with optical quality invisibly close to the Ultravid's but at a lower price. Both have the same warranty. A best buy among the top five scorers! 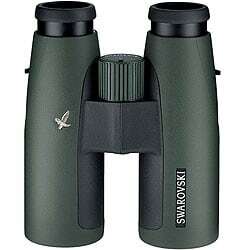 Swarovski recently upgraded almost every feature of its rugged SLCnew binocular to improve performance even more. The SLC HD now sports Swaroclean, Swarobright, Swarodur, and Swarotop coatings in addition to flouride containing HD lenses. The large field of view due to the wide-angle eyepiece and a terrific 6 foot close focus are real features and the strong magnesium housing enhances it's reputation for toughness. 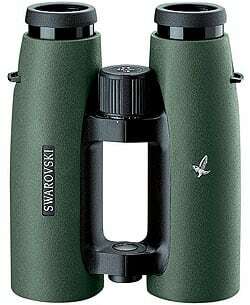 Birdwatcher's Digest comments: "The Swarovski SLC HD has the standard bridge design and is slightly shorter than the open-bridge Swarovision. Redesigned in 2010, the SLC now has HD glass and a magnesium housing, and it weighs just half an ounce more than the Swarovision. Tying for first place in our resolution tests, the SLC HD provides a bright, sharp image with outstanding contrast and color, which along with its wide field of view (408 feet) contributes to the viewer's experience of being magically transported into the scene. It has an excellent focus knob, although it's only wide enough for one finger. The diopter adjustment mechanism, under the focus knob, differs from the one on the EL Swarovision in that you can't see the setting when it's locked. The twist-up eyecup design resembles the Swarovision's but has three rather than four possible positions. Caveat: Some judges reported that corners of the armored bridge housing near the bottom of the focus knob poked their fingers." The high-quality HD ED optical system of Alpen's NEW Rainier binoculars maximizes light transmission to bring every last ray of light to your eyes even in the worst flat-light, dawn or dusk conditions. HD (high-definition) ED (Extra-low Dispersion Glass) delivers the best premium-performance and a very high level of clarity. All optical components receive get a multi-layer coating for maximum light transmission. The extra large BAK-4 prisms are coated with over 60 layers of Alpen's SHR metallic and PXA phase coatings to deliver the best brightness, clarity and color fidelity. Large diameter lens elements throughout the optical system provide enhanced field of view and eye relief for easy viewing. Birdwatcher's Digest comments: "Among our second tier, the Alpen Rainier won the highest overall score. 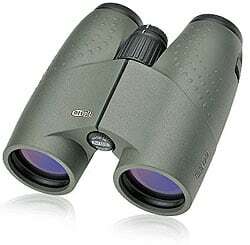 This open-bridge binocular has ergonomic engineering and high-definition, extra-low dispersion glass. On the underside of the barrels, the hollows that provide extra security for a person's thumbs are wide and shallow enough not to interfere with how a person holds the binoculars. The Rainier focuses close (6.5 feet) and has great eye relief (18mm). The faultless diopter adjustment mechanism, located under the focus knob, locks and has an easy-to-read scale and detents. The eyecups are a little different than on most binoculars. When you twist up the eyecup to its maximum extension, it locks to prevent accidental collapse. To unlock the eyecup, you pull out slightly and twist clockwise. It's easy once you know how it works. Warranty: Alpen displays a remarkable message on its home page: "If you have any problem with your Alpen product for any reason, send it back and we will repair or replace it free - period." Caveat: Some users not wearing eyeglasses find the eyecups do not extend far enough to let them brace the binoculars against their face." Made in Germany using all their latest technology, the Zeiss Conquest HD offers premium performance at a more affordable price. The Zeiss HD lens system is said to provide exceptional views that according to them "set new standards for true color reproduction". Its slim line design makes the Conquest HD especially compact for a 8x42 binocular, while robust construction means it can handle the challenges of rugged use. The Conquest also used Zeiss's LotuTec lens coatings that allow water to roll straight off the lens, it also makes removing dirt or smudges much easier and thus reduces the risk of scratches to the lens when cleaning. Birdwatcher's Digest comments: "The new Zeiss Conquest HD earned the top resolution score in our second tier. The Conquest HD gives birders the opportunity to enjoy full-sized, German-manufactured, Zeiss binoculars for less than $1,000. This model is more compact and a bit lighter than the Zeiss Victory FL. With 18mm of eye relief, it's good with eyeglasses. It has the same Zeiss LotuTec water-repellent coatings as the Victory FL. A difference between the Conquest and the Victory FL is the diopter adjustment, which is on an eyepiece and has neither scale nor lock. The focus knob is excellent but is only wide enough for one finger. A best buy! 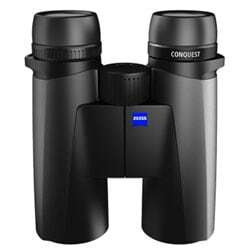 Warranty: The Conquest HD comes with a Zeiss limited lifetime transferable warranty plus a 5-year No Fault Policy." The DCF ED is Pentax's best binocular and is according to Eagle Optics one of their favourites for "shoppers wanting superior brightness and edge-to-edge sharpness". 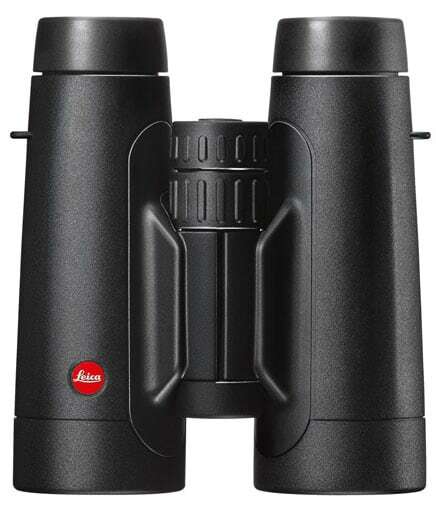 The lightweight magnesium alloy body, long eye relief, and short close focus make this binocular a valuable tool for use in a variety of situations. With ED glass, phase coated roof prisms, and fully multi-coated optics, the Pentax DCF ED should produce an image with outstanding color resolution, tack-sharp images, and excellent light transmission. Birdwatcher's Digest comments: "Pentax DCF ED has excellent optics, providing a bright, clear image. It's lightweight and has excellent ergonomic qualities. The focus knob, one of the best, turns smoothly and precisely and is wide enough for two fingers or gloves. The twist-up eyecups have detents and provide four steps of extension. Eye relief of 22mm is the longest in our survey and should work with any style of eyeglasses. The diopter adjustment, on the right eyepiece, locks but has only a minimal scale." 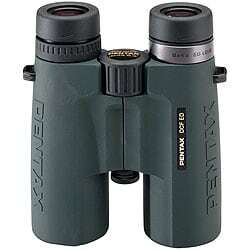 Warranty: The Pentax Worry-Free warranty guarantees enjoyment of this binocular for years to come. Caveat: Some of our judges without eyeglasses complained that the eyecups didn't extend far enough. Some found that the strap lugs poked their hands. Two of the most impressive aspects of this 8x42 Meopta MeoStar is their very compact design and the incredibly wide view which is 411 feet wide at a distance of 1000 yards. The only binocular to beat this in this line up was the Opticron Aurora BGA 8x42, which is only 2 feet wider at the same distance. Birdwatcher's Digest comments: "The least expensive in thier top of the ranfe survey, the Meopta Meostar had the second widest field of view (411 feet). It's compact—only 5.5 inches long—and has a solid feel. The strap lugs recess into the barrels, so they never interfere with the hands, and the thumb indentations are shallow and elicited no complaints." Warranty: Meopta Sports Optics products are guaranteed to be free from defects in materials and workmanship for the life of the product. Caveat: The diopter adjustment does not lock, and it's positioned on the focus knob where it can easily be moved unintentionally. Birdwatcher's Digest and their local birders quantified each binoculars' ability to resolve fine detail, using a U.S. Air Force 1951 optics resolution chart. This was achieved by mounting the binoculars side by side on a stable, vibration free platform. The lighting conditions were controlled carefully and each pair of binoculars was tested multiple times. The testers then compared each one with a pair of reference binoculars to confirm that what they were seeing was not influenced by eye fatigue or other temporary issues. They then kept testing until they agreed on a consistent relative score. What they found was that the binoculars in their survey showed similar resolution at 8x. However, when they magnified the images to 32x, using two stacked doublers, differences in resolution became clearer. Even then, the top five binoculars tied in their resolution scores, showing no consistent, repeatable differences across multiple trials. The Resolution Score column in the accompanying chart shows the binoculars' relative performances at 32x. The lower-scoring binoculars in our survey are not bad optically. However, they inevitably, and perhaps unfairly, suffer when being compared with the best optics in the world. As one would expect of binoculars in this price range, all had great focus knobs: smooth, precise, and without slack or jerkiness. Some offered the advantage of being wide enough to fit two fingers. These might be more glove-friendly in winter, and they gave them a bump in their focus knob scores. They also measured how many turns the full focus range took and included the results in the chart. Because they consider focus speed to be a matter of personal preference, however, this did not affect the score. According to the testers, all the binoculars had good twist-up eyecups to adjust for proper eye relief. Most had detents that help hold a partial extension. Those few without detents got a lower score. On a few binoculars, the eyecups didn't extend far enough for some of the judges if they were not wearing eyeglasses. Their scores were not reduced for this, which was noted it as a caveat in the individual reviews. IPoints were deducted from binoculars lacking a diopter scale or lock. The Leicas scored the highest because of their large, easy-to see dial on the focus knob, which made it tops for confirming the diopter setting at a glance. 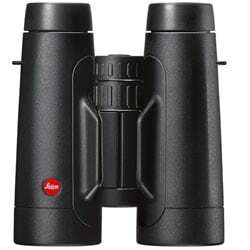 Hand-friendly, grippy-textured armoring characterizes all of these binoculars. The Zeiss Victory got the top score because of overall ergonomic excellence and extra credit for how well the barrels fit the palm of the hand. The Leicas got dinged for the prominent thumb ridges that some judges complained about. They penalized binoculars whose strap lugs poked the hands. I would like to add that if you are into birdwatching, then you really should take a look at the Bird Watcher's Digest magazine, modeled after the Reader's Digest, they print six issues a year that is filled with articles, stories top tips and tons of useful information on everything to do with birding. If you don't want a hard copy, you can actually also subscribe to the digital version, or if you don't want to subscribe, you can just purchase the individual issue you want, which is great. Tip: If you do decide to subscribe to their Print Edition, rather than doing this on their website, where it currently will cost you $19.99 per year, get the subscription: Bird Watchers Digest Subscription on Amazon.com for only $16.99 per year.